Well, no mail again today. Two planes came up but neither one had mail on it. I guess I got enough yesterday to last for a while though. Really hot today! I got that money order for USAFI and mailed it in today. I also ordered a pair of sunglasses and put a roll of slide film in at the PX. That roll of film didn't seem to work right in the camera. I don't know if it will turn out. For 90 cents I guess I can't go wrong. Went to Freedom Hill PX this afternoon and afterwards we went bowling at the bowling alley next to the PX. It's really a nice place. Just like stateside. The only thing that's missing is the air-conditioning and the automatic pin setters. There are mamma-sans who pick up the pins and set them in racks. You have to watch out for them when you bowl and make sure they get out of the way. They have their own little ways of making the game more interesting. Like moving the pins around. 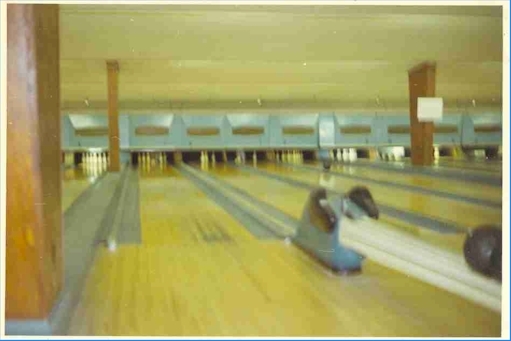 And every time we would be bowling for a spare with only one pin left she would reach down and pick it up just before the ball hit it. A 20 lane bowling alley in the middle of Vietnam and it doesn't cost a cent to use it! There is a guy down the other end of the room moaning and yelling and rolling in his bed. He's in pretty bad shape. Apparently he has been on some kind of hard drugs. We sent someone to get the chaplain. I think he needs a doctor more than he needs a chaplain right now. He is one of the transients. Well, they're taking him out of here now. He is walking so I guess he isn't in that bad a shape. I'm not in much of a mood for writing right now. More tomorrow.